Welcome to the Cub Scout Pack 223 Website! Cub Scout Pack 223 (including what was formerly Pack 61) is made up of boys from around East Brunswick, New Jersey, to include all East Brunswick Elementary Schools. We are a part of the Middlesex District of the Monmouth Council. It is the goal of the Pack to introduce the boys and their families to the incredible experience of Scouting with the adventures, values and life long memories that go with it. With patience and leaders that lead by example, the boys will learn the core values of Scouting and will always be prepared! 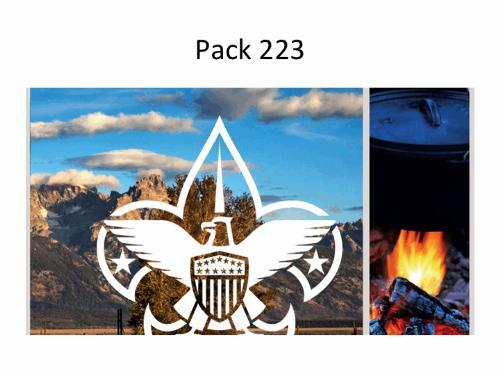 If you are interested in learning more about Pack 223, please contact our Cubmaster, Jim Pullaro at jim.pullaro@gmail.com, call 732-867-PACK, or browse our Public Site pages.